It’s been an incredible few weeks for the Irish nation as we voted by a resounding margin to repeal the 8th amendment from the Constitution. But there is still more to be done before women and pregnant people can start accessing abortion care in Ireland. Can we now access abortion care services here at home? Not yet. What the vote did was to remove the clause in the constitution which restricted the rights of pregnant people to access abortion unless their life was in danger. The removal of this clause means that the Oireachtas will now be able to legislate for abortion provision. The 36th Amendment, stating that “provision may be made by law for the regulation of termination of pregnancy”, will be signed into law by the President after the outstanding legal challenges have been resolved. The Government will then be free to pass legislation in the usual way. It could. The Government published the draft legislation already – which ensures access to abortion on request for up to 12 weeks of pregnancy and in limited circumstances (where there is a risk to the health of the pregnant woman or in cases of fatal foetal abnormality) thereafter. Last week, the government announced that the bill enabling them to pass legislation on abortion would be brought before the Cabinet on 10th July and considered by the Dail over the following 2 days (and the next week if necessary) before being sent to the Oireachtas committee on health. The report stage of the bill (where final amendments can be made) will be considered by the Dail after the summer recess and it will then go to the Seanad for consideration. The intention remains that the legislation will be passed in early Autumn, with abortion being practicably available in 2019. Fine Gael TDs will have a free vote on the legislation and proposed amendments, so it is important that they hear from the general public on the kind of legislation that we want. We will be urging people to speak to their elected representatives in the Dail and advocating politicians to ensure that any legislation passed ensures access to free, safe and legal abortion care. We welcome recent assurances from Minister Simon Harris that affordability will not be a barrier to receiving abortion care in Ireland and the calls to ensure the enforcement of exclusion zones outside clinics. 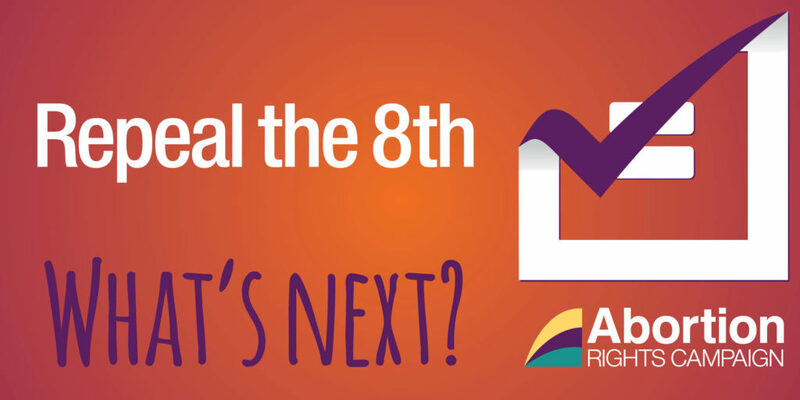 Although we have changed history monumentally though voting to repeal the 8th amendment, until legislation is passed we find ourselves in a period of transition. People needing abortions in Ireland will continue to be forced to travel to England or access abortion pills online. Those from marginalised groups will continue to be disproportionately affected. This is why it is imperative that the legislation regulating abortion access be passed as soon as possible. Some TDs have called for laws surrounding the decriminalisation of abortion and the restrictions on information set out in the 1995 Information Act to be removed with immediate effect, as well as for the Government to cover the costs of women with FFA pregnancies who are forced to travel to other jurisdictions in the interim. We would add to this a call for the Government to immediately address the issue of rogue crisis pregnancy counselling agencies and ensure that pregnant people in Ireland may no longer be misled about abortion and their options during pregnancy. This being said, the proposed legislation only allows abortion on request up to 12 weeks. Such a short time period means that there will always be people who fall through the cracks of this legislation and will still be forced to access abortion outside the Irish jurisdiction. We are concerned that the proposed legislation does not go far enough in ensuring realistic access to abortion services. During the referendum campaign the government went to great lengths to make it clear that abortion access after 12 weeks would be highly restricted and their proposal puts the power solely in the hands of medical gatekeepers. We believe that while there should be appropriate medical supports in place to help anyone faced with an unexpected pregnancy, the best people to make the ultimate decision about their healthcare are the individuals themselves. As you can see, we have a lot of work ahead of us in order to ensure that the impending legislation is as effective and inclusive as possible. One of the most powerful ways of doing this is for members of the public to get in touch with their elected representatives and explain the importance of free, safe and legal abortion care and what it means to them. We’re currently working on a guide to help you do just this so stay tuned!